On Feb. 6, Missouri’s governor signed right-to-work legislation into law, making Missouri the 28th state to wake up to the fact that freedom of choice for workers is a major boon for their citizens, businesses, and economies. The midwest is now swelling with right-to-work states. Indiana and Michigan became right-to-work states in 2012. West Virginia passed legislation in 2016, as did Kentucky in 2017. The only remaining state bordering Ohio without right-to-work legislation is Pennsylvania. Ohio, Illinois, and Minnesota are now the only non-right-to-work states in the midwest. The south is solidly right-to-work, from Texas and Oklahoma east all the way to Florida and Virginia. It is clear that right-to-work has reached a tipping point, and states that have not enacted legislation are becoming an anomaly, especially in our region of the country. Unfortunately for Ohioans, this means that our state is falling behind the competition and losing jobs and opportunities to surrounding states. The concept behind right-to-work legislation is simple: let workers decide if they want to join a union, or not. The right of individuals to form associations is a touchstone of American democracy, contributing as much to our culture as it does to our economy. However, when associations become involuntary and dues are forced as a condition of employment — as many union contracts dictate — this is no right of association, but a violation of individual liberty and personal decision making. Right-to-work laws do not prohibit unions. They simply make union dues voluntary, returning to individuals the choice of whether they wish to belong to that union. This allows employees to withdraw their support and hard earned dollars from a union if they do not agree with its positions or feel it is no longer an effective advocate for their interests, and still maintain their livelihood. Right-to-work laws also provide a considerable economic advantage, as they are often a major factor for businesses when deciding where to locate. 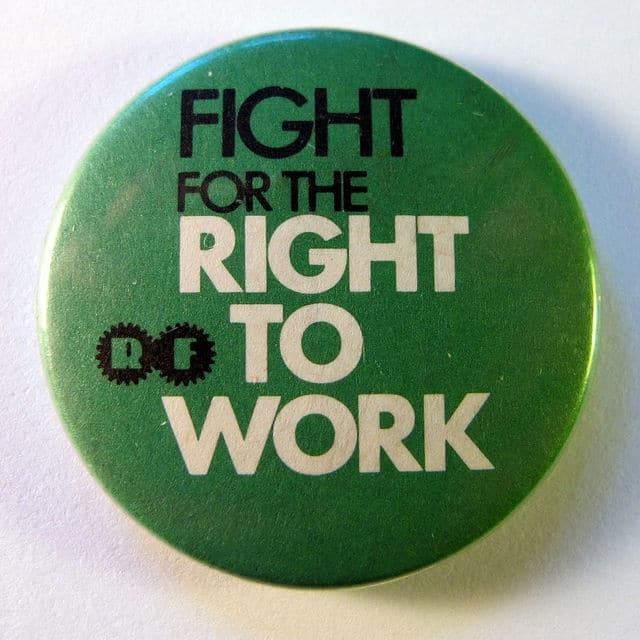 Between 1990 and 2014, the Bureau of Labor Statistics data show that employment in right-to-work states grew twice as fast as it did in non-right-to-work states. If Ohio does not act now, we will continue to lose out to surrounding states. That is why I am working with my colleagues at the Statehouse to ensure that all Ohioans have freedom in the workplace. I am encouraged that federal lawmakers also introduced a right-to-work bill in Congress on Feb. 1. Until the much-needed relief comes, however, local governments now have the ability to enact right-to-work policies locally. In November of last year, the United States 6th Circuit Court of Appeals issued a ruling upholding the right of local jurisdictions to enact such policies. This case came out of Kentucky, which now has statewide right-to-work legislation, due in part to the pressure that local governments put on the state legislature through their own right-to-work policies. While I hope that we soon have right-to-work statewide or nationally, I applaud any local governments that decide to take matters into their own hands and act in the interest of their citizens and their economic vitality. Wesley A. Goodman, R-Cardington, represents Ohio’s 87th District in the Ohio House of Representatives.